Last weekend’s gig pick post was all about quality not quantity, and we promised we’d be back this week bigger than ever. We’re still not scrimping on quality but we’re probably featuring more gigs this week than we ever have done. We’re going to kick things off with a couple of gigs happening tonight. Normally we treat Thursday as the start of the weekend, but when two of favourite bands are playing we’d be fools not to give them a mention. 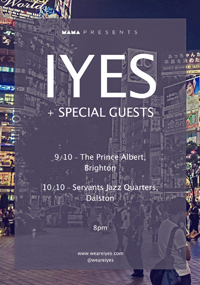 IYES play their first ever headline show at the Prince Albert, which we’re very excited about. We’ve been huge fans since we first heard Lighthouse at the end of the year, and they haven’t disappointed since. Best of all it’s a free gig! Elsewhere, down at the Blind Tiger, Brighton Music Blog favourites The New Union are supporting Let’s Buy Happiness. Thursday night is where we normally start our weekend gig round up, and the weekend proper is starting strong with Calico headlining Sticky Mike’s Frog Bar. Support comes from 900 Spaces and Blackwell, and it’s four pounds to get in. Meanwhile, Normanton Street are playing at the Mesmerist. On Friday some more of our favourite bands are supporting at the same gig. Pawws are supported by the fantastic GAPS and Dog in the Snow (as well as Saint Savanna, who are local and new to us). And it’s a free gig – Green Door Store, you do spoil us. There’s also a free gig at the Blind Tiger, headlined by Transformer, with support from Eagles for Hands, whose new EP we love. 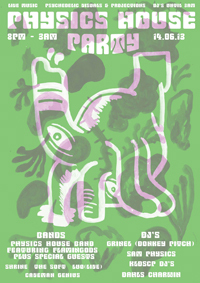 Saturday night’s big gig is the Physics House Party taking place at Sticky Mike’s. As well as the awesome Physics House Band, AK/DK, Alphabets Heaven and Suffer Like G Did are also playing. Over at Fitzherberts, Speak Galactic and Soft Arrows are playing at a night called Ruff Stuff, where Owen from Speak Galactic and some of his old bandmates from Cinemascopes are unveiling a new project called Merlin Tonto. 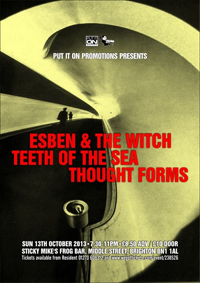 Rounding off the weekend nicely at Sticky Mike’s, Esben & The Witch play the Brighton leg of their national tour promoting Wash The Sins Not Only The Face. At the Green door store, there’s an event to commemorate the 40th anniversary of Gram Parsons early death in 1973, aged only 26. There’s loads of local bands getting involved – the list includes The Self Help Group, Dollboy, and Amy Hill plus various members of Laish, The Repeat Prescriptions, Super U, The Standard Lamps, Woodland Blue, The Pooh Sticks, Lolly & the City of Flies, Redlands Palomino Company, Englemann Spruce, and Lost Dog. Get there early enough and you’ll also get to see Pete Wiggs from Saint Etienne DJing before the live acts. Here’s this weekend’s gig picks for you all. This week we’re extending things out to Monday, because there’s a gig that we can’t not mention. On Friday night Martin Rossiter headlines the Source New Music Night at the Dome Studio Theatre. Support comes from The Beautiful Word and Jacko Hooper so this should be a bit special. Tickets are a bit pricier than a normal Source New Music though – so if you’d rather save your pennies then head down to Sticky Mike’s where the Physics House Band are hosting another Physics House Party. They’re playing a headline set with members of Flamingods, and there’s support from Luo, Caveman Genius, Demob Happy, and Shrine. Hush Hush Friday at the Blind Tiger caught our eye too – another free gig with FVNERALS topping the bill and Dog in the Snow supporting. Saturday Night’s pick is Clowns, who are playing at the Prince Albert. 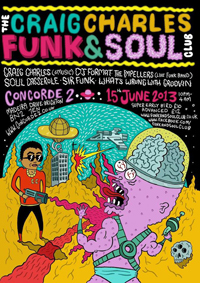 If you like your weekends a bit funkier then The Impellers are on the bill at Craig Charles Funk and Soul Club at the Concorde. 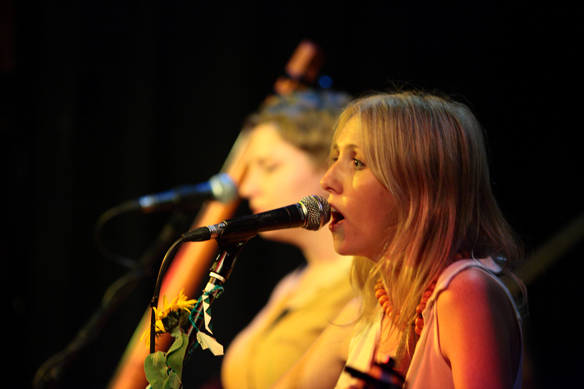 Brighton Folk comes back to the Brunswick on Sunday Night, with Amy Hill and The Galleons playing. Last Thursday Amy Hill invited us along to the launch of her debut album Place of Mind. On the door as we arrived everyone was given a copy of the album, and I was hoping this write up would be a review of both the album and the night. Unfortunately, every time I put the cd into my computer iTunes freezes up, which is why this blog post is both a little delayed, and a little incomplete in terms of what I was hoping it would include. We arrived at The Brunswick a bit too late to see Jacko Hooper, but did catch most of Choice’s folky set, which involved a multi-instrumentalist using looping pedals alongside a live drummer. By this point, it was good to see that the venue was already full. 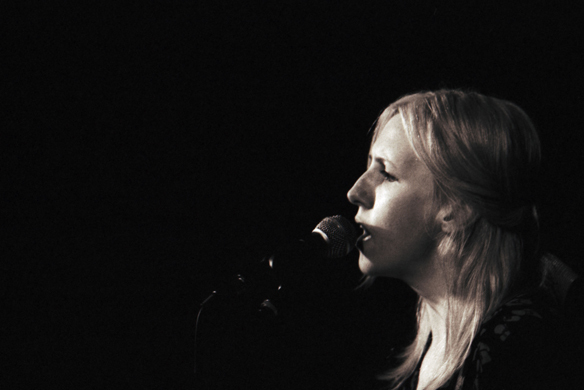 Amy Hill has been hosting the monthly Brighton Folk night for years. Every month she plays a song or two inbetween acts, solo and acoustic, but it’s a rare treat to see her playing a full set. 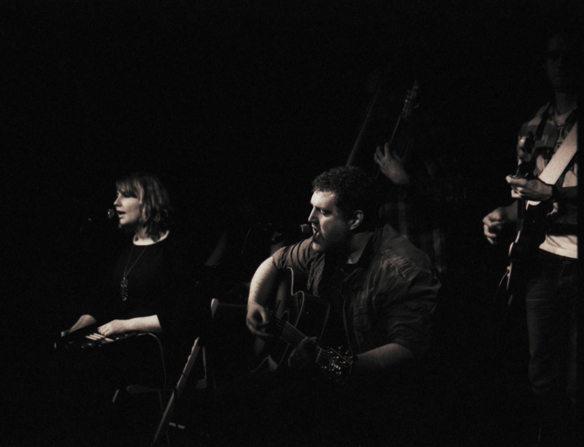 On Thursday some songs were stripped back to just Amy and her guitar, but others were played with a full band who included Phil and Beth from The Galleons – regulars at Brighton Folk. This extra dimension shows an added depth that you wouldn’t see at one of her regular nights and is a welcome addition, elevating her sound above folky singer songwriter fare to something somewhere between Beth Orton and Sheryl Crow. Amy sung about life’s simple pleasures – friends, music, nature – and it’s safe to say that everyone in the room was sharing in that pleasure. At the end of the gig, after she had performed all of the tracks on the album, Amy was called back on stage an encore where she played a b-side from an earlier EP. Apparently it was her first ever encore, and it was obviously a very special moment – a fitting end to a great night. The next Brighton Folk takes place this Sunday night at the Brunswick and features Mike Newsham, Donna Fullman and Sam Green. We missed a round of gig picks last week because of holidays (ours, not bands playing in Brighton), but we’re back this week. The weather is getting warm enough that you can’t use it as an excuse for not leaving the house any more, so here’s what we recommend when you do get out. On Thursday night Amy Hill – who hosts the long running Brighton Folk night – launches her album Place of Mind at the Brunswick. Support comes from Jacko Hooper, which should be good. Friday night see’s the latest Brighton Rocks night at Sticky Mike’s headlined by Devil in Detail. We’re going to be heading out of Brighton to the Con Club in Lewes where Clowns are playing. Saturday night’s big gig is Pere Ubu at the Haunt, put on by Melting Vinyl. While they might not be thought of as a local band, their legendary lynchpin David Thomas is a Brightonian these days, so the date on their tour to support new album The Lady From Shanghai is something of a homecoming. 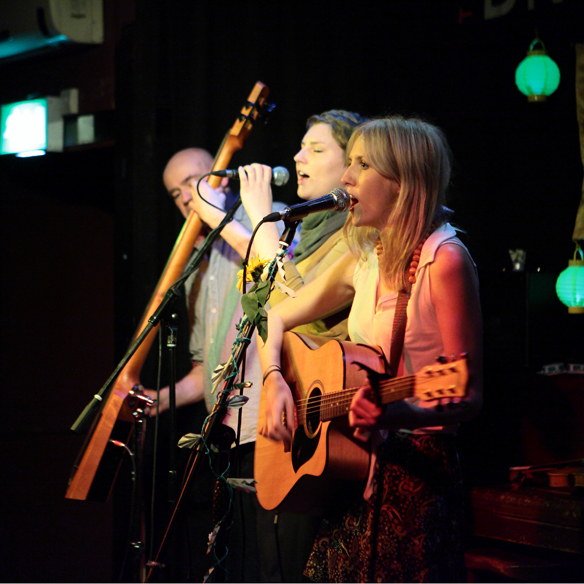 Every third Sunday of the month, Brighton Folk is held, at the Brunswick pub. It’s been running for a few years now and is a pretty established part of the Brighton music scene. Last night, two local acts were on the bill – The Galleons and Peanut Albinos. The evening started off, as ever, with Amy Hill playing a few of her own folk songs. Peanut Albinos might have been playing in the side room at a pub in Hove, but when you closed your eyes, you might as well have been in a whiskey bar in America. Actually, if you ignored the rest of the pub and just looked at the stage, you could easily imagine the same. 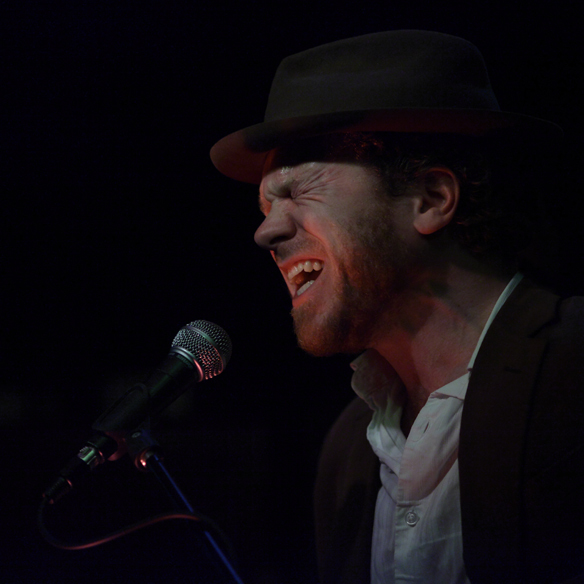 Sonically, it’s as if Tom Waits were fronting an stateside version of The Pogues. It’s music to get drunk, dance and sing along to. They brought their own crowd along, but they didn’t need to – even without them there, they would have raised the roof.